Multi Level, Terraced Garden with bespoke shed! Our new project was to design a garden for our client, within their budget, which was to incorporate the steep slope of the garden. We designed a garden that was multi level giving our client various elements to their garden. We had a lower patio area with a bespoke shed, built to the exact size for the space available. We then built a pair of stone raised beds either side of the stone steps, this led to the first terraced level which was the grassed area. 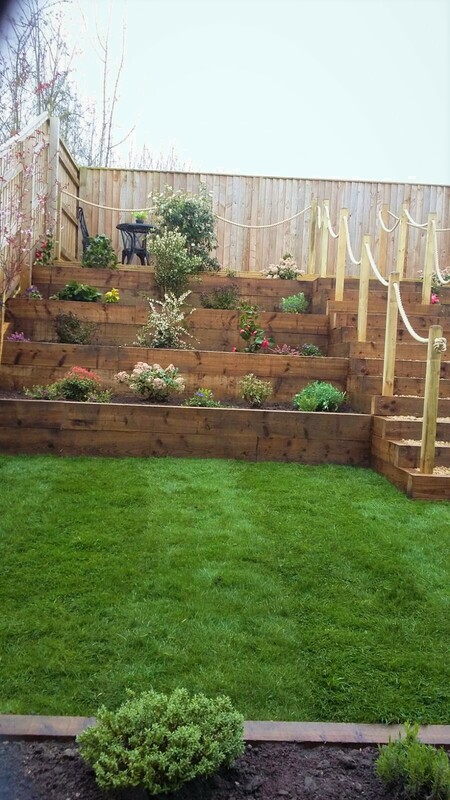 We built wooden steps filled with decorative stone, they had wood posts either side with rope handrails. Either side of the steps we built raised sleeper beds, which were planted out with various plants and shrubs to give colour and interest all year round. The steps lead upto the final level which is the decked patio seating area, all enclosed with the rope safety rail. This gives a lovely view of the whole landscaped garden and the house, which we think is rather spectacular! The team worked very hard on this project, and our clients were extremely happy with our design and our "Prompt and Effective Work"! Another successful project completed on time and in budget. Smiley faces all round! What a great way to make use of such a large sloped garden! Looks amazing. Can’t wait to see your future projects.